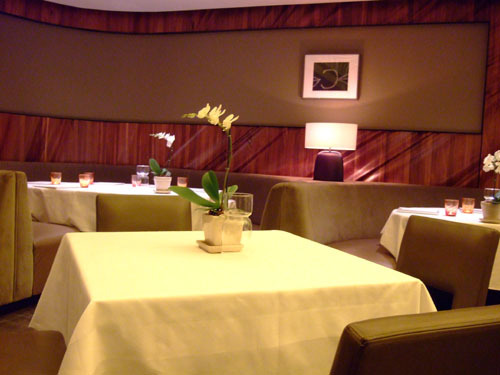 Patina is the flagship restaurant in Joachim Splichal's sprawling culinary empire. It is the second of Splichal's restaurants I've sampled (the first was Catal at Downtown Disney), but the first fine dining establishment. I had known of the restaurant for a long time, but just never got around to trying it. 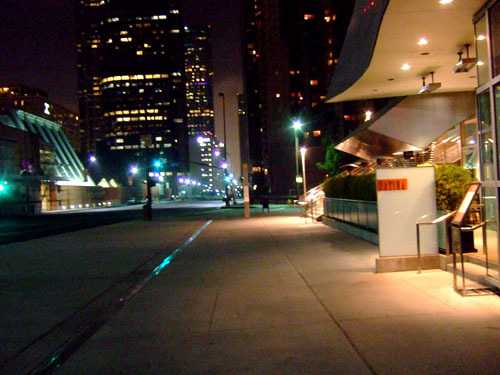 However, based on our experience, there looks to be a good chance we'll be dining at another Patina Group establishment, Leatherby's Cafe Rouge, which is, interesting enough, also located in a performing arts venue: the Segerstrom Concert Hall in Costa Mesa. 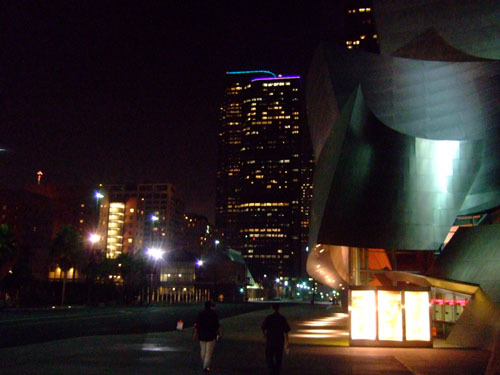 Patina is located on Grand Avenue, in the heart of Downtown LA, in the Frank Gehry-designed Walt Disney Concert Hall. The interior is clean, contemporary, and awash in soft yellow light (which made for difficult photo-taking). 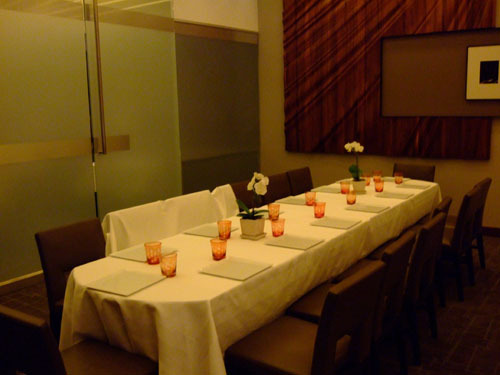 The main dining holds about two dozen tables and booths, while a private dining room and chef's table are also available. 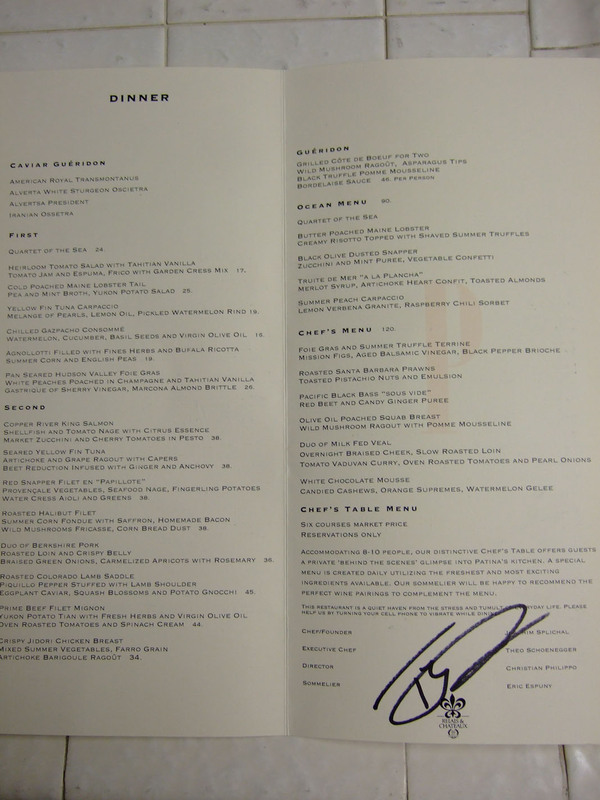 We enjoyed both the Chef's Menu and the Ocean Menu (we added on a halibut course to balance the number of courses). 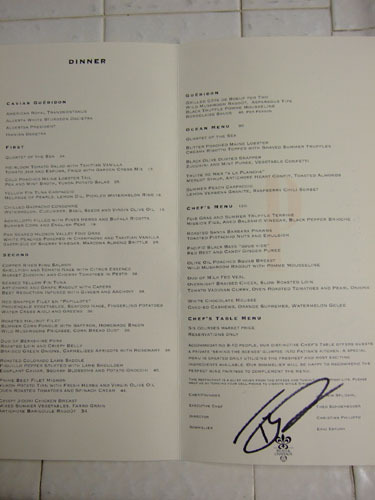 Note the signature of Executive Chef Theo Schoenegger. 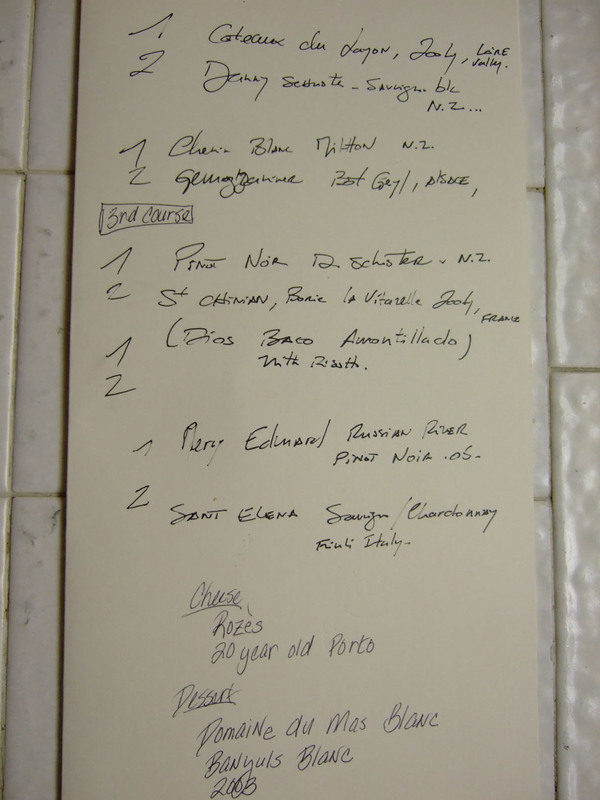 We also requested that the wine pairings be written down. 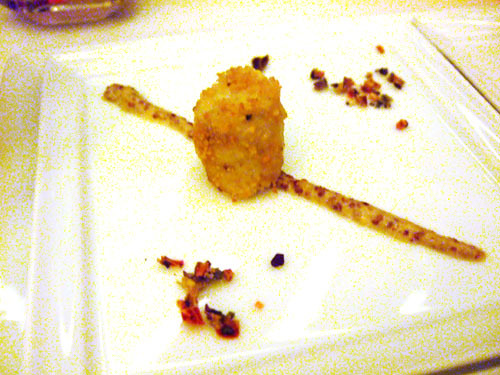 Unfortunately, the pairings for the third course were left out. I've since sent an email to sommelier Eric Espuny but have yet to hear back. Click for larger versions. 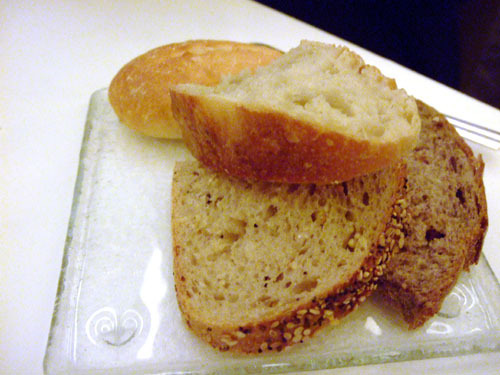 Four types of bread were offered: potato leek, ciabatta, walnut, and sesame. 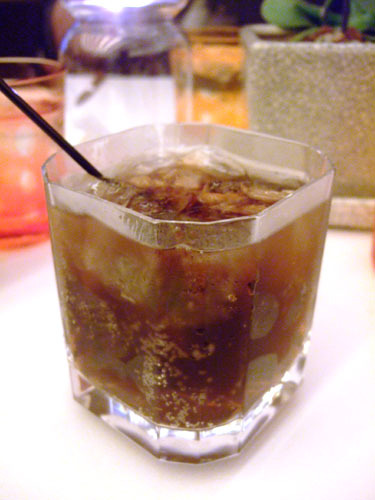 After being denied my signature mojito, I chose instead a Cuba Libre (rum, cola, lime juice), which proved to be noticeably better than your standard rum & coke. 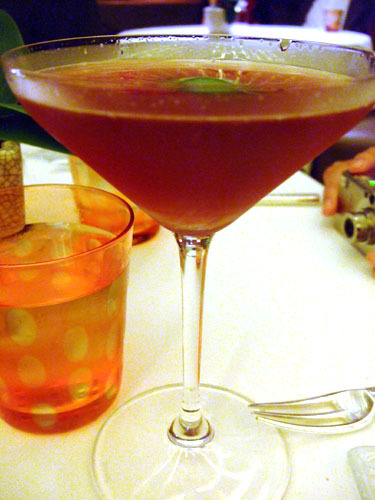 One of my dining companions ordered a Metropolitan (a cosmo with pomegranate vodka, pomegranate juice, and triple sec). With soy, pickled onion tempura, and balsamic vinegar. 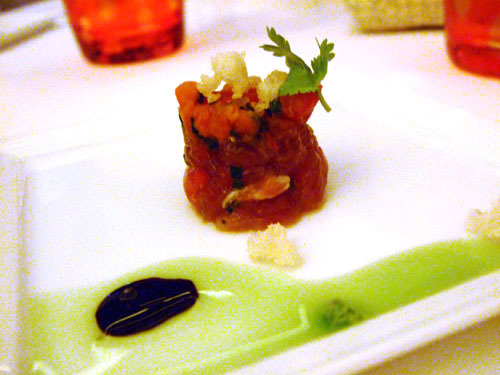 Tuna tartare almost seems clichéd to me these days, but this was a genuinely good example, especially for an amuse. A good start. 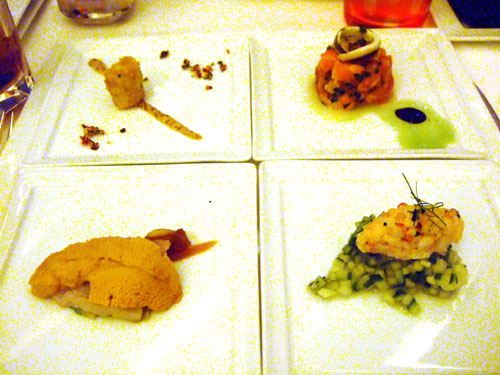 The quartet consisted of (clockwise from top-left): crabcake (too much breading, weak mustard), salmon tartare (my favorite, fairly complex, with a resilient texture and a little spice), lobster salad (a bit too much cucumber, but otherwise quite good), and uni/hamachi sashimi (over avocado, with very fresh tasting uni). 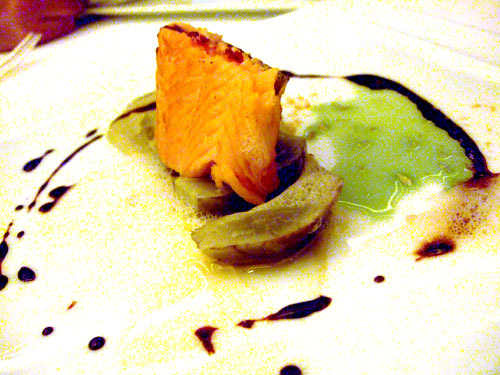 The paired Sauvignon Blanc was typical of the New Zealand style, with a noticeable dryness, restrained fruit, and good structure. 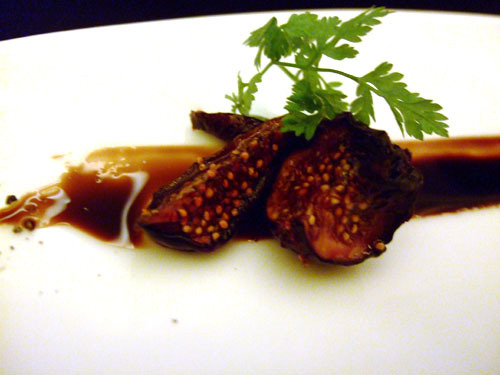 Mission Figs, Aged Balsamic Vinegar, Black Pepper Brioche. 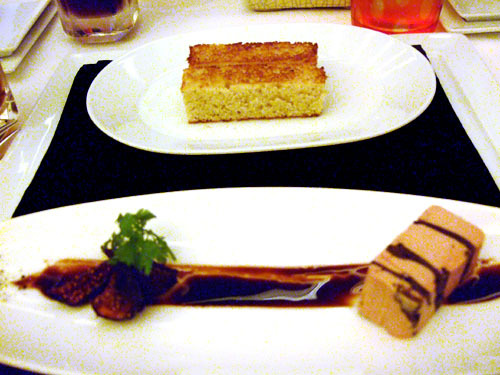 A very nice terrine of foie gras (though not up to French Laundry levels), I especially enjoyed the layers of truffle. 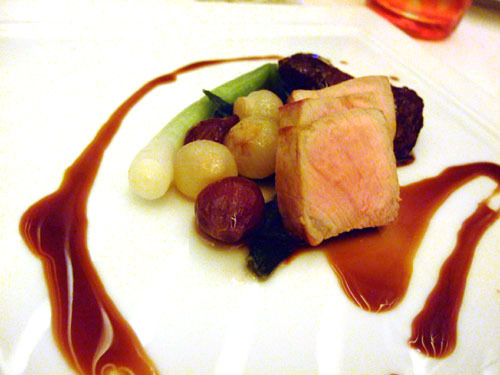 The wine was also quite good: a sweet Chenin Blanc with heavy notes of Sauternes, it provided a classic foil to the foie. 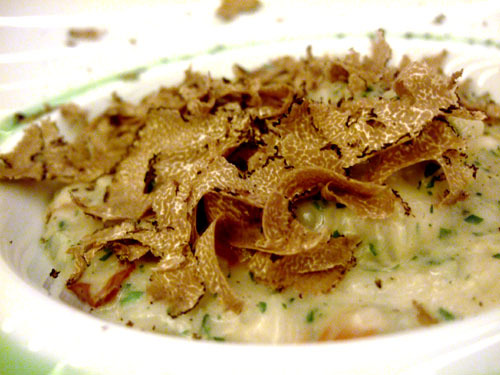 Creamy Risotto Topped with Shaved Summer Truffles. I used to scoff at risotto; "It's just rice, big deal!" I'd think. Well, this was a revelation. 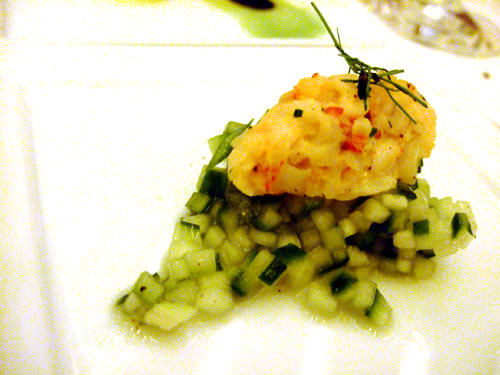 Creamy, flavorful, with huge chunks of lobster, the risotto stole the show. Note the liberal application of black truffle! 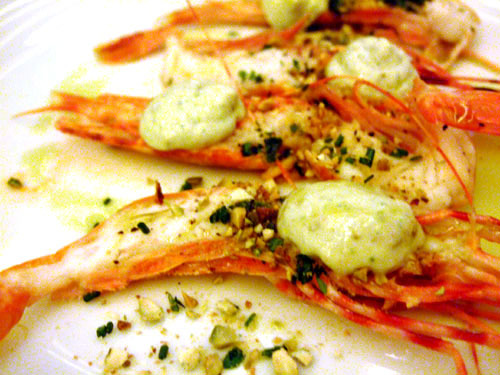 Toasted Pistachio Nuts and Emulsion. I liked the slight tang of the dill(?) 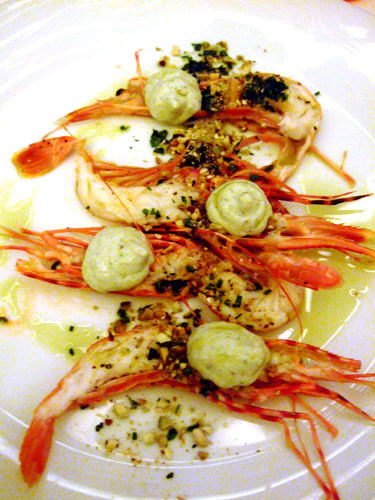 cream, but wished that the prawns were a bit meatier. What a tease! The second Chenin Blanc of the night was completely unlike the first, with sharp acidity, slight minerality, and dry notes of stone fruit and honey. 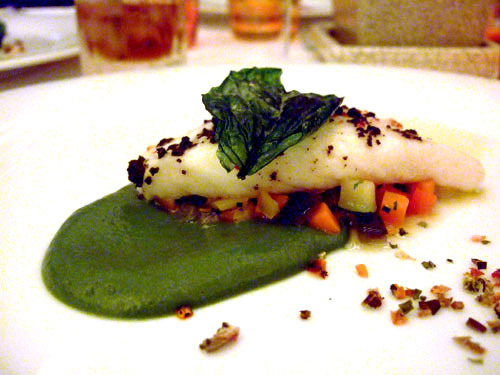 Zucchini and Mint Puree, Vegetable Confetti. 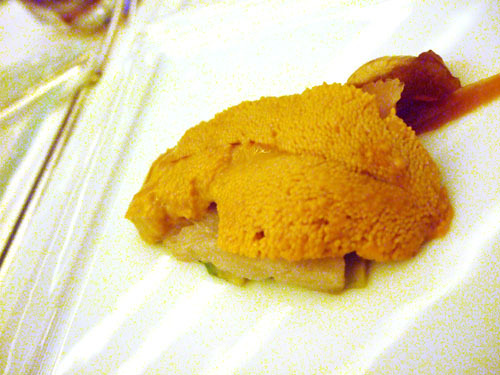 This had a texture that was quite unlike any snapper I've had before, which wasn't necessarily a bad thing. The flavor was a bit too mild for me however. 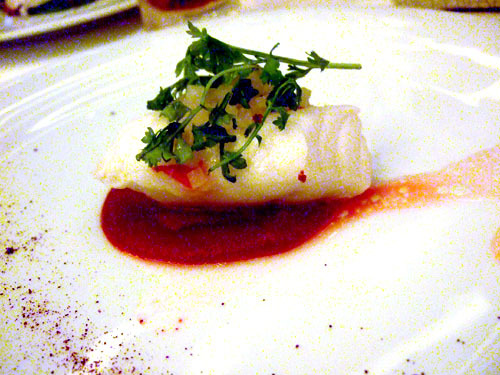 3b: Pacific Black Bass "Sous Vide"
Red Beet and Candy Ginger Puree. One of the better preparations of bass I've had actually, with a nice texture. I found the beet puree to be a bit overpowering however. Interestingly enough, I believe this was actually paired with a red wine. 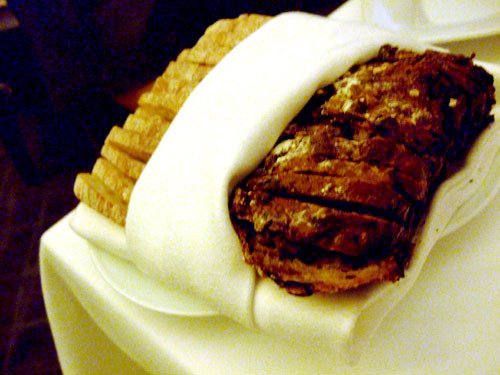 4a: Truite de Mer "A la Plancha"
Merlot Syrup, Artichoke Heart Confit, Toasted Almonds. 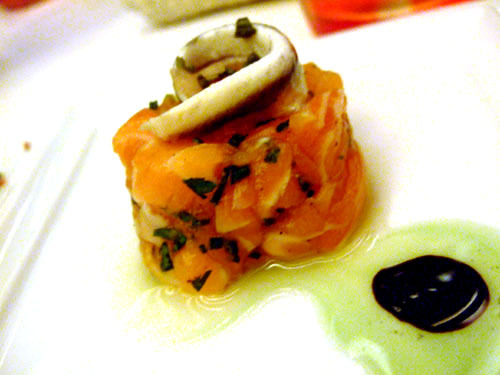 I thought this was salmon when I first saw it, but it turns out that Truite de Mer is simply sea trout. 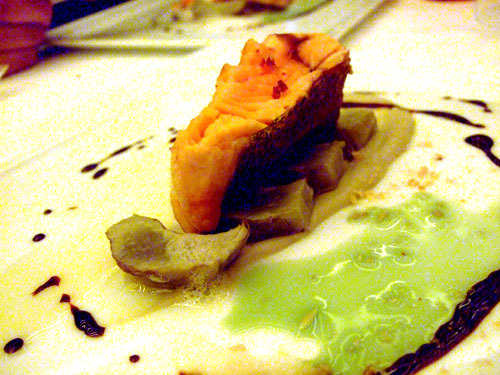 As such, it was similar in texture and taste to salmon. Loved the crispy skin. 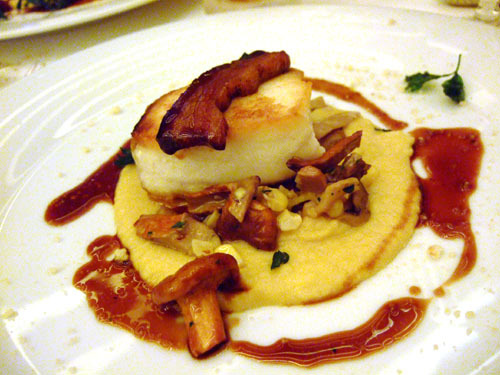 Wild Mushroom Ragout with Pomme Mousseline. 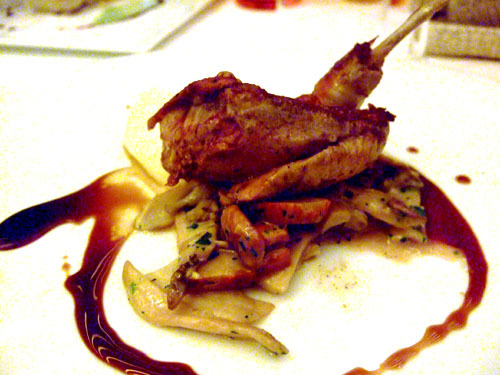 Another nice preparation of squab, the bird has yet to let me down. 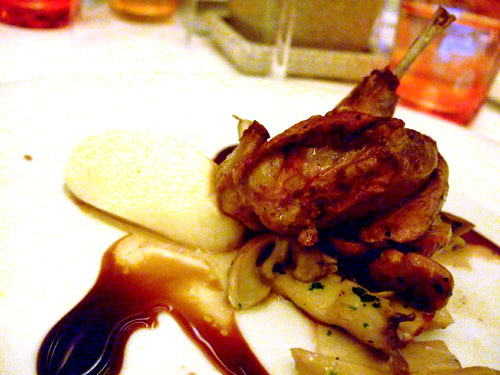 Flavorful and tender, it went very nicely with the Pinot, which had notable hints of smoke, berries, and oak. 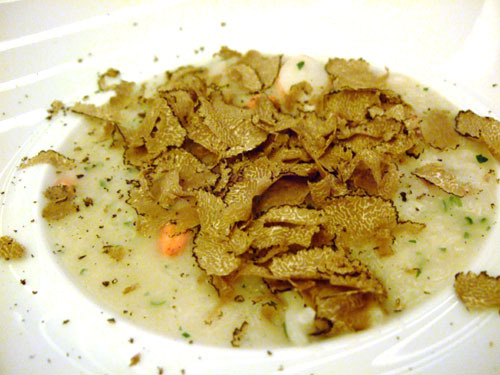 Topped with Shaved Summer Truffles. 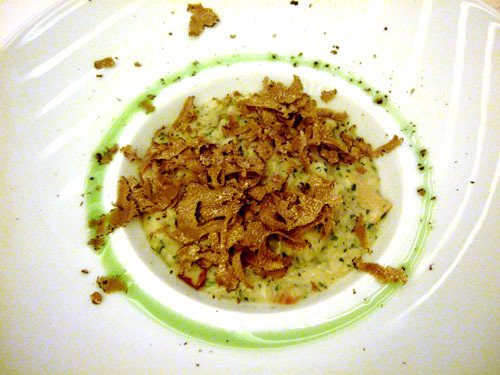 Another fantastic course of risotto. I can't decide if I like this or the version above better. 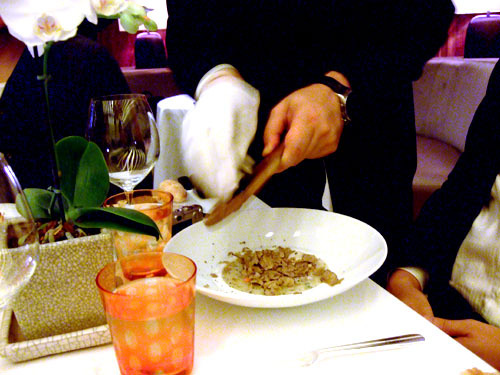 I really liked the big chunks of lobster in the first preparation, but the mushroom here perhaps pairs better with the rich, pungent earthiness of the truffle. Summer Corn Fondue with Saffron, Homemade Bacon, Wild Mushrooms Fricasse, Corn Bread Dust. 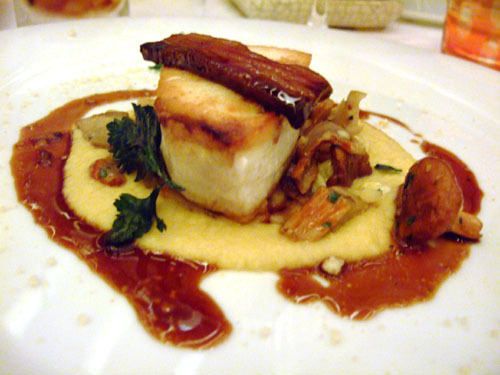 I was actually not a fan of this dish, as I found the halibut too mild in flavor. This was helped out, however, by the mushroom and bacon, which were rather savory. The wine pairing, a mix of Chard and Sauv Blanc, was quite good. Overnight Braised Cheek, Slow Roasted Loin, Tomato Vaduvan Curry, Oven Roasted Tomatoes and Pearl Onions. 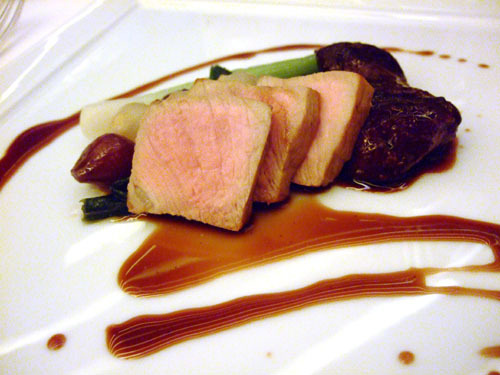 I liked the super-tender, fatty, flavorful braised preparation but thought that the loin was a bit dry. Nice Pinot with this one. I'm pretty sure Patina had the largest selection of cheeses I've ever encountered. 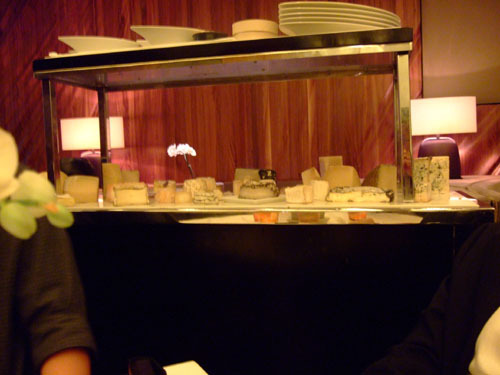 I do appreciate a nice cheese cart, a sight that's sadly becoming rarer and rarer these days. We were given five selections, from hard to liquid, cow to sheep to goat. All were quite good. 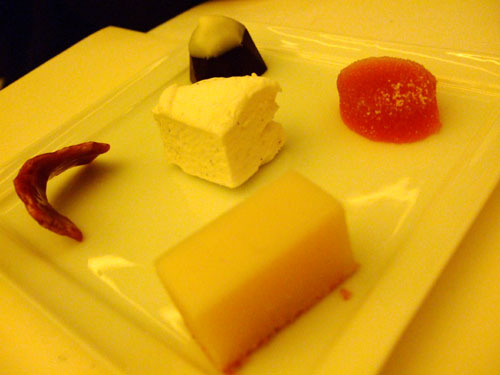 Unfortunately, I only recall that the first cheese was an Abbaye de Belloc; the others escape me. 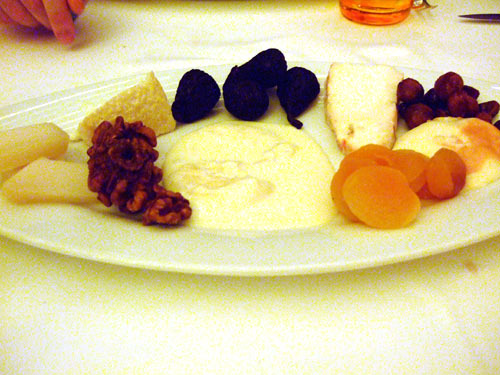 The cheese was served with two types of nut and fruit bread, walnuts, figs, candied peanuts, and dried apricots. 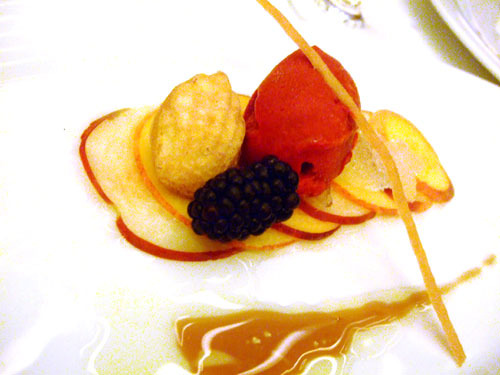 Lemon Verbena Granite, Raspberry Chili Sorbet. The peach was quite sweet, especially when taken with the granite. Surprisingly, for something with chili, the sorbet wasn't particularly spicy. I did thoroughly enjoy the paired dessert wine, a sweet mix of Grenache, Muscat, and Malvoisie. 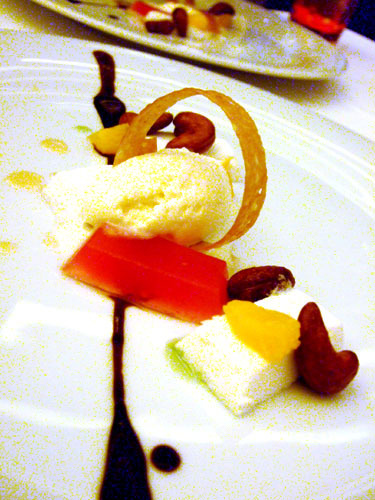 Candied Cashews, Orange Supremes, Watermelon Gelee. This actually reminded me of the white chocolate dessert I had at Providence, though I think the execution was a bit better here. 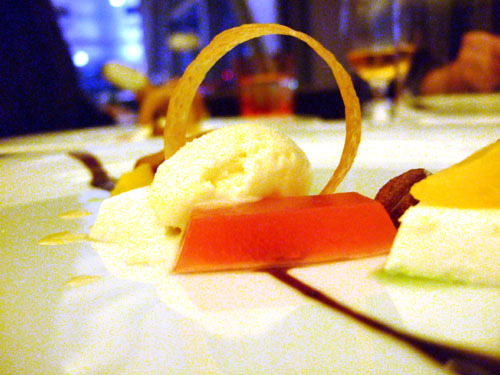 Dark chocolate truffle, rhubarb gelee, white chocolate cake, praline bitter, and marshmallow vanilla puff. 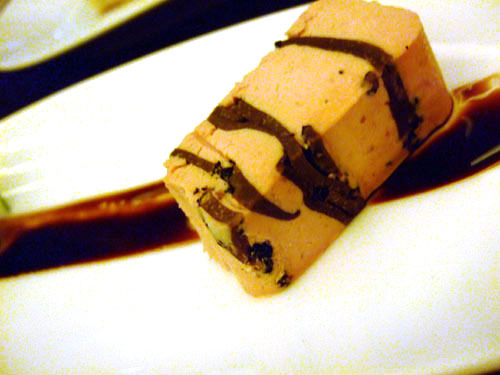 My favorite was the truffle, though the praline was quite interesting. 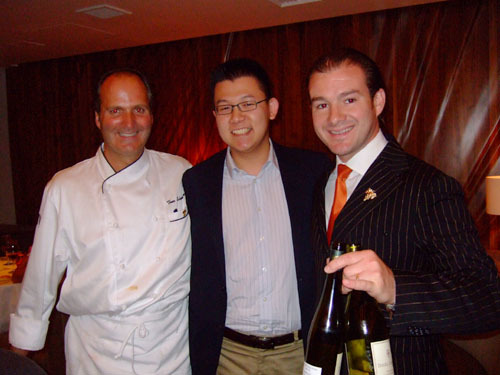 With Chef Theo and Sommelier Eric. I'm curious how you would rank Patina. 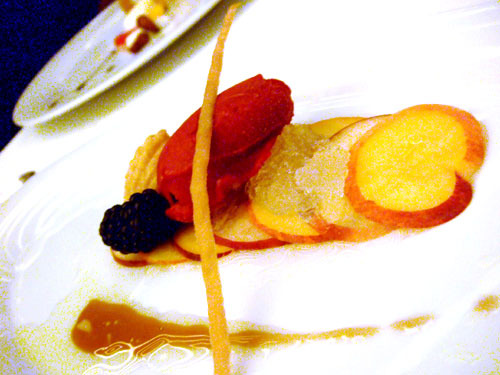 It seems like there were a few misses in the tasting menu by your report. Would you say it deserves its 1 star? 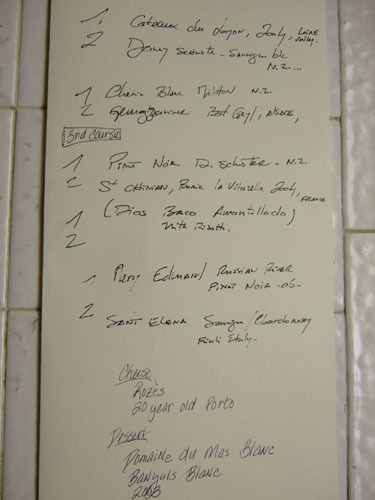 Also what was the price of the wine pairings, if you don't mind me asking? Indeed, there were a few misses, but I don't think 1-star is too far off the mark, though I imagine you could argue it either way. Given the other 1-stars in LA, I think it can fit. The wine pairing was $75 if I recall correctly. And you get NY, SF, and LV to boot. I just came across your review and I thought it was very informative. 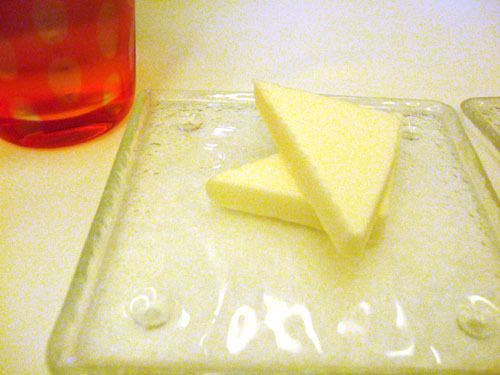 I went into Patina just for cheese and dessert a few weeks ago, and thought it was the best way to go. I even got dessert wine pairings, and it just added a little pizzazz to the already delectable desserts! You should try that one day as well. wow they certainly didn't stint on the truffles! how much was the tasting menu? Rich, the Ocean Menu was $90 and the Chef's Menu was $120. And no, they didn't skimp on the truffles! 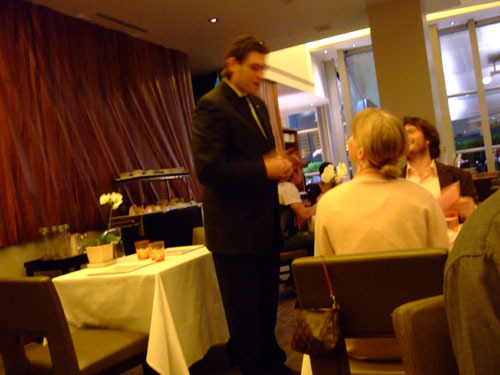 Since Chef Tony Esnault has left Martha Stewart and become the Exective Chef for Patina, do you plan to visit there soon since you did not get to taste his food at Adour in NYC. Dason, I do want to go back, but don't have any plans to do so in the near future. So many restaurants I need to try! 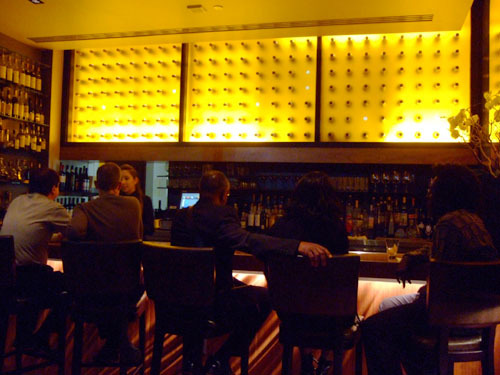 Was in LA on business and was dying for some cheese, so popped into Patina for a late supper--didn't have high expectations due to some mediocre experiences with Patina Group. All I can say is that there is some pretty perfect execution going on in the kitchen--I had the tasting menu and wine pairing. They brought me back to the kitchen (without my asking, by the way) to meet Tony Esnault--serious guy for sure. You may want to put it back on your radar before Tony moves on--he said he would be staying for a while, but he didn't really strike me as a corporate guy. Thanks for the update David. I wouldn't mind giving Patina another go sometime. 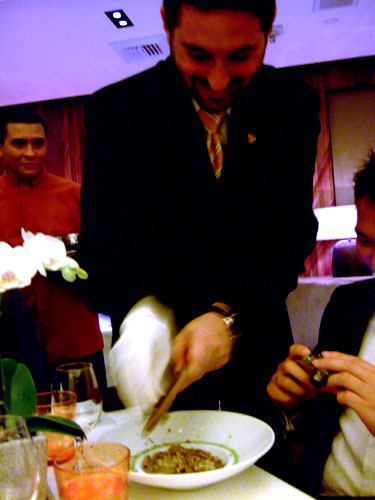 I'm somewhat curious about Esnault, since he previously worked for Ducasse in NY.